Danish Army Specific: First deliverance took place in 1969. Used by regimental commanders, etc. 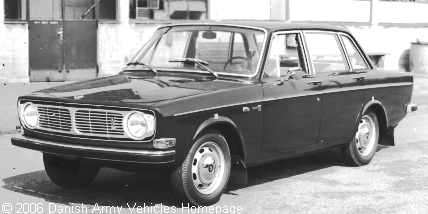 Historical: In 1966 the Volvo 144 was introduced and was voted Car of the Year in Scandinavia. Bigger than the Amazon, the Volvo 144 was an improvement in terms of both active and passive safety. Disc brakes all round were standard, while the dual-circuit braking system was a major advance. The body was provided with energy-absorbent crumple zones and the steering wheel was of the collapsible type. On the 1969 model the engine had been changed to a B-20 engine with 82 HP, and on the S models 100 HP. When the production seized in in 1974 more than 500.000 vehicles had been made. Length: 4.65 m (182 inches). Width: 1.73 m (67 inches). Height: 1.45 m (57 inches). Weight: 1.675 kg (3.685 lb.). Engine: Own 4-cylinder, type B20A, 1.986 cm3 (121 cubic inches), liquid cooled. Horsepower: 82 at 4.700 rpm. Fuel capacity: 58 liter (13 gallons). Additional: Some vehicles had electric overdrive, and some a 3-speed automatic gearbox. Acquisition price in 1973 was around 23.000,- DKr. Also an updated version were delivered.